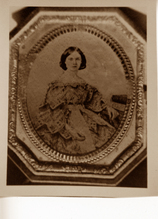 Comments: SARAH JANE PEACE (Nee: YOUNGBLOOD) | LA UNITED STATES | 1851-1900 | Comments: SARAH JANE KNOWN AS SALLIE. WIFE OF HENRY T PEACE. A FINE SOUTHERN LADY.